Does anyone else enjoy how facebook brings up memories for your view each day? I do! Although I realize that this isn’t posted on the day I write the post, today is California Girls birthday! She would kill me if I told you her age, so suffice it to say she is younger than I am and absolutely fabulous! Facebook didn’t remind me it was her birthday, ( I, of course, have that commited to memory) but it did bring up a birthday outing we took last year to Angele, a French restaurant in Napa. 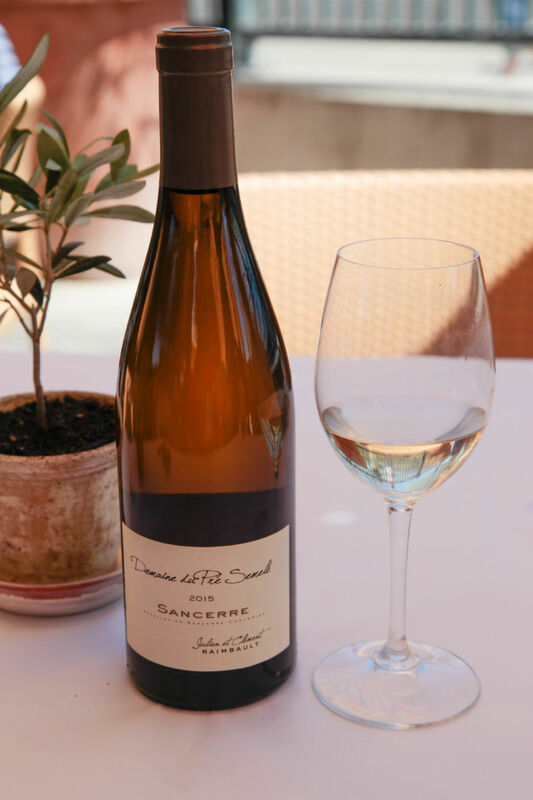 California Girl Comments: Hey, it was my birthday and they have Sancerre! It’s rare to find, and even rarer to get by the glass. I love Angele which is located right in Napa downtown on the waterfront. We named it as one of our favorite restaurants for 2016. 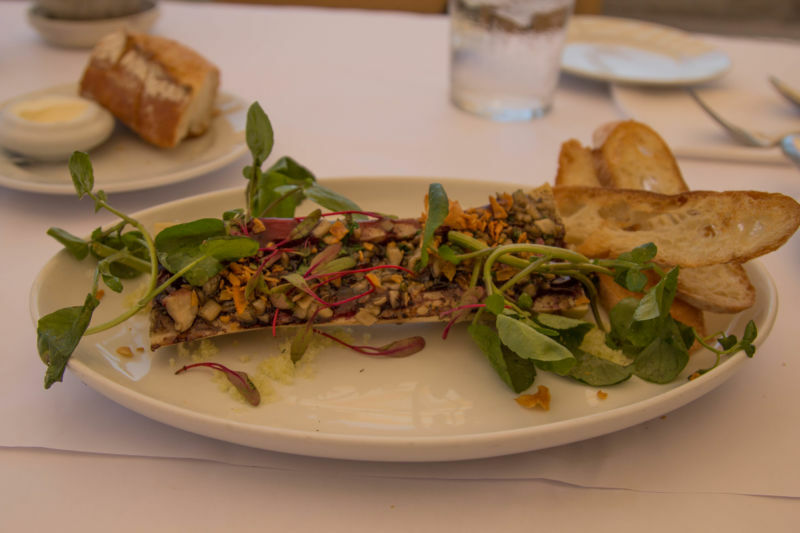 I realize I am a bit of a country girl, and don’t have near the sophistication of my charming cohort…but California Girl was quite wary of ordering the bone marrow and was certain I wouldn’t give it a try. Much to her surprise, I loved it, and after returning from my trip to see her I promptly went to my local butcher and had him saw up some cow legs for me so I could replicate the dish I had enjoyed so much! 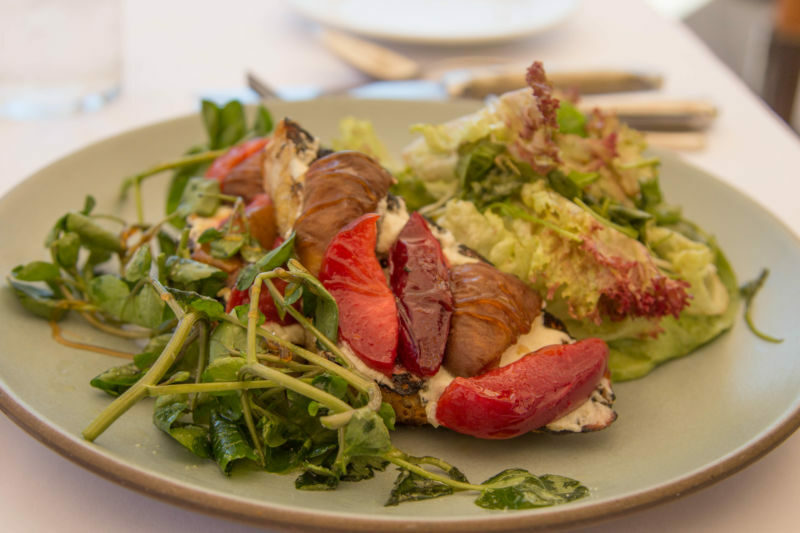 California Girl Comments: Its not about having a sophisticated palate here, its getting over people’s preconceived ideas about what something is or will taste like. Many people won’t eat escargot for example simply because the idea of eating snails doesn’t appeal to them. Once they try them though, they are hooked! You have to remember that this dish started out as peasant food and a way to use up all of the animal. In France, there is nothing gourmet about this dish. Chef’s here buy these cheap bones and charge a fortune for them and call it gourmet. 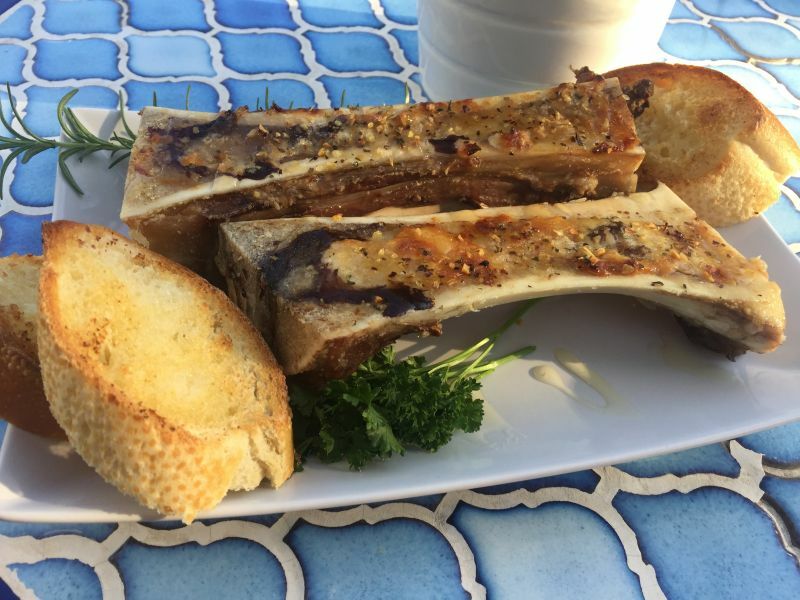 Since then I have made roasted bone marrow many times, and refined the recipe for my taste; changing the herbs and seasonings frequently just in the celebration of experimentation! And although this recipe presents as utterly spectacular and will certainly amaze and impress your guests, it is simple and easy enough to make for yourself or your family. California Girl Comments: Let’s talk about what bone marrow actually tastes like. Once the bone marrow is all roasted it becomes soft and gooey like butter. 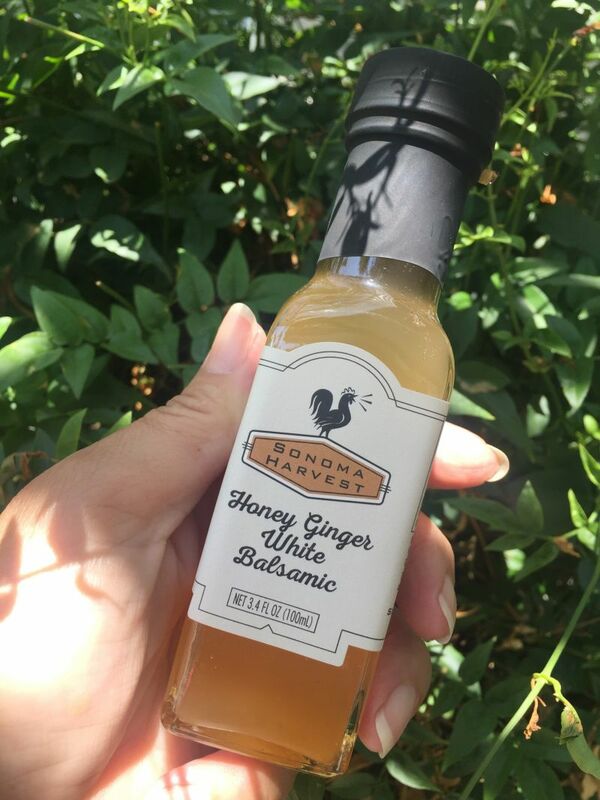 The flavor is rich and meaty with a buttery quality to it that is fantastic! So, first, either go down personally, or call your butcher, and ask for femur bones cut lengthwise. Tell them what they are for, and they should know what you are looking for. You can also do cross cut femur bones, but I don’t think they present nearly as beautifully as the bones cut lengthwise. I always order 10-15 pounds at a time, and freeze them so I have them whenever I get the craving for this delicious treat! First, line a roasting pan with foil for easy clean up. 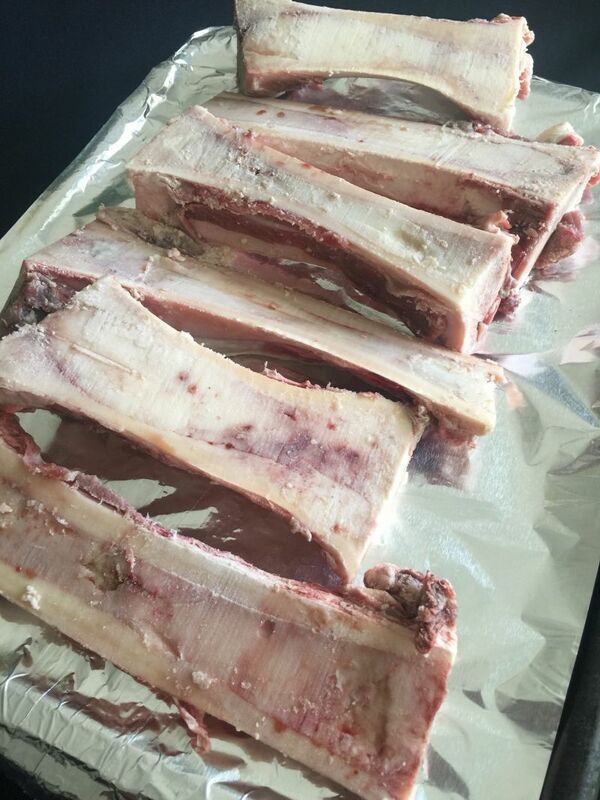 Line the raw bones with marrow side up, on the roasting pan. 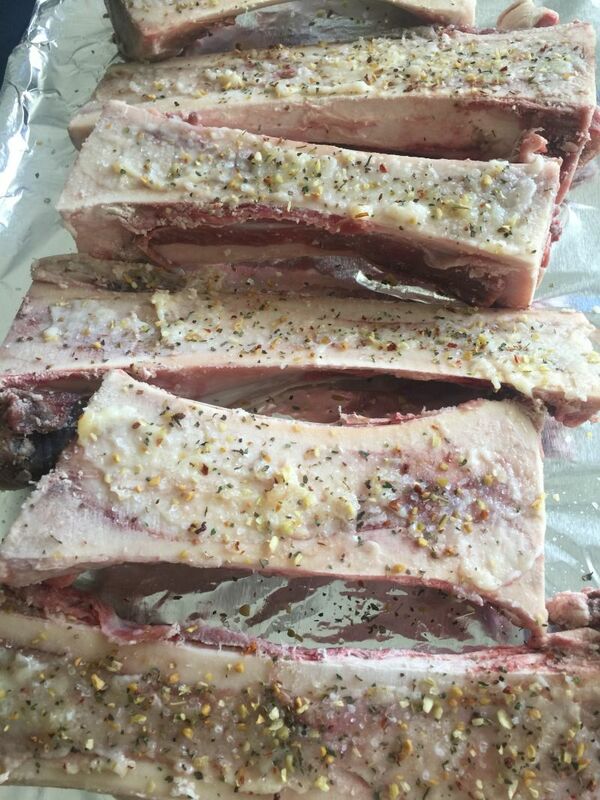 Spread a layer of crushed garlic or garlic paste on the marrow side of the bones, covering the entire surface. Sprinkle with salt, pepper, or desired seasoning. 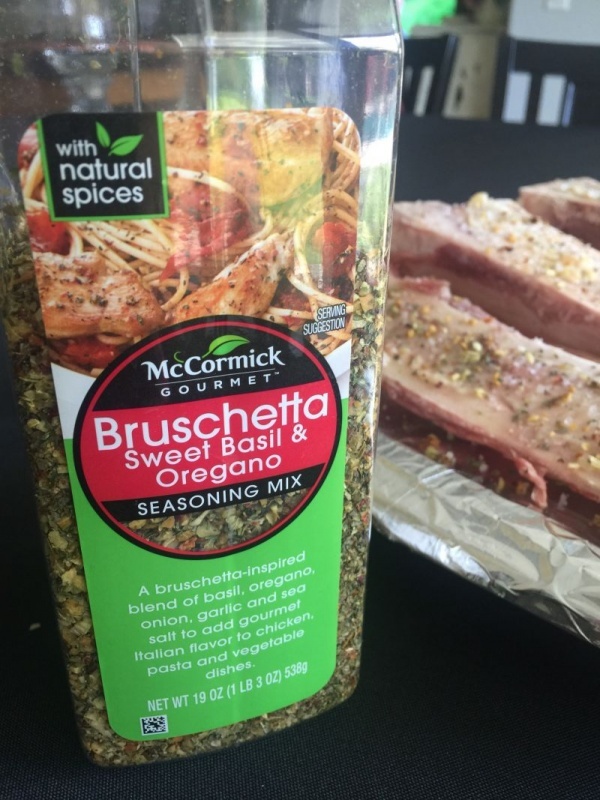 I used this McCormick Bruschetta Seasoning, and skipped the salt and pepper and it was truly amazing! Place in the oven and bake or roast at 350 degrees for 20-30 minutes, or until the tops are golden brown and toasty! The marrow should bubble a bit as the fat content cooks! Ovens vary, so remove them from the oven when the bones look golden brown and lucsious! **While the bones are roasting, spread a thin layer of butter on the sliced baguette pieces and add crushed garlic over the butter. Place on a cookie sheet, and as soon as the bones come out of the oven, place the bread under the broiler until golden brown. 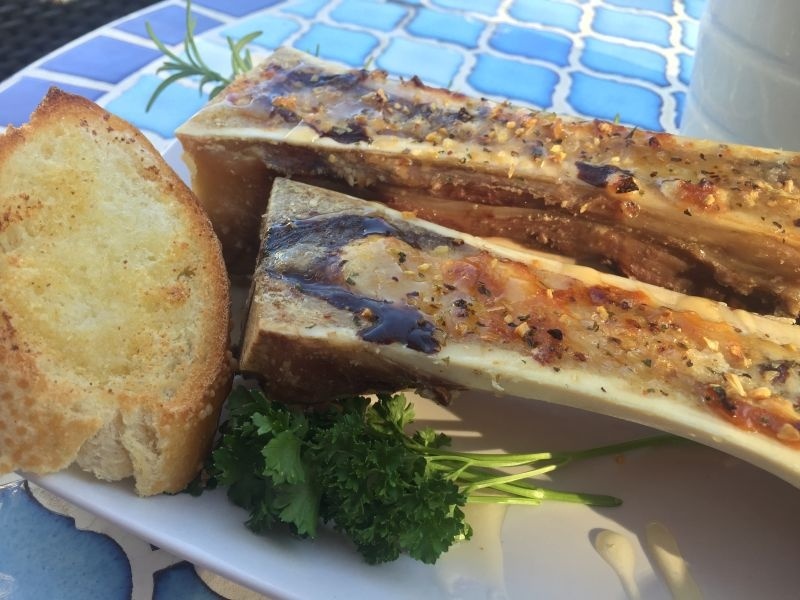 To serve, place 2 bones per person on a small plate and drizzle with the reduced balsamic vinegar. 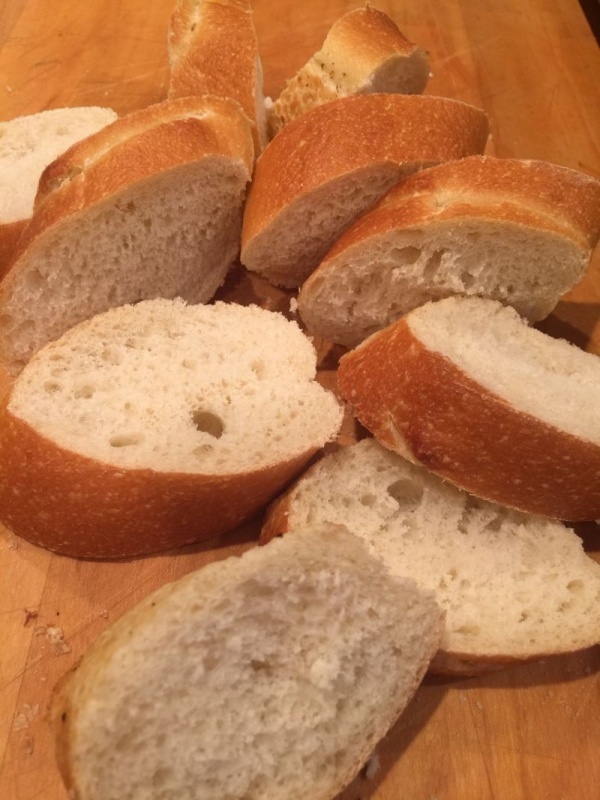 Serve with the warm garlic toast. 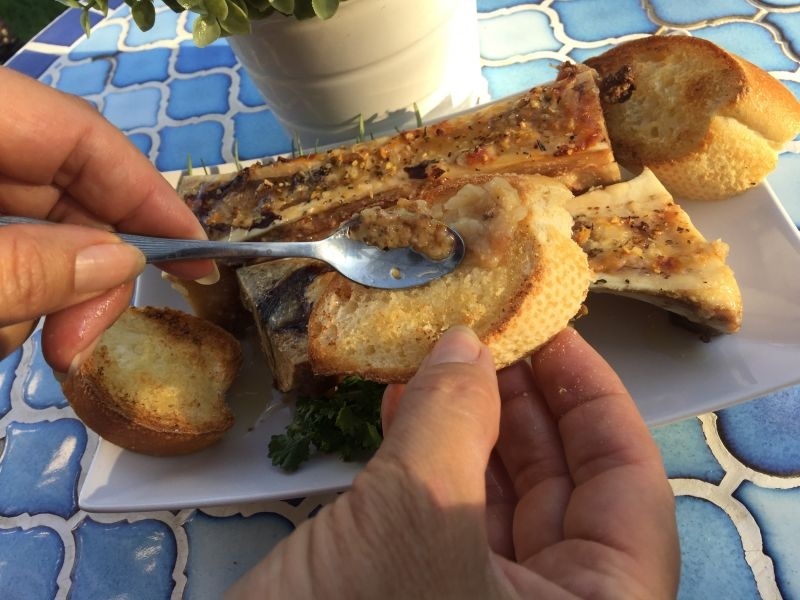 The cooked bone marrow is scooped out with a small spoon and spread on the toast! It is delicious! This appetizer makes you look like a 5 star chef! Give it a try! Easy, and looks absolutely amazing!